Let me first start by expressing how incredibly excited I am to be writing this post. It is by far my most asked about, most retweeted and favorited tweet. I have to brag for a minute and say that Erin Klien (@klienerin) even featured my "What Stuck With You?" in The Tweeted Times, an awesome day for me in which I basked in the glory of 5 minutes of Twitter fame! Anyhow, I truly hope that this post inspires at least one of you out there to try this or some iteration of it. Reflection is a key piece of any lesson. Too often teachers rush through material in hopes of meeting a content deadline without pausing for a breath or taking a moment to consider student understanding of material. In room 309 our class either begins (after students have done a flipped lesson) or ends (on days when class is mostly direct instruction focused) with a "What Stuck With You?" I saw a few elementary school versions of this on Pinterest.com, a goldmine of resources for teachers for those of you who have yet to discover it, and decided to tailor it to my classroom needs. Many high school classrooms lack color and pizazz, (among other things; cue adding 'Creative Learning Spaces' to my list of future blog posts regarding things I hope to someday accomplish in my classroom) which is part of the reason why I love our "What Stuck With You" wall. Every student, teacher, and administrator that walks into my classroom is immediately drawn to our colorful archive of knowledge and progress. 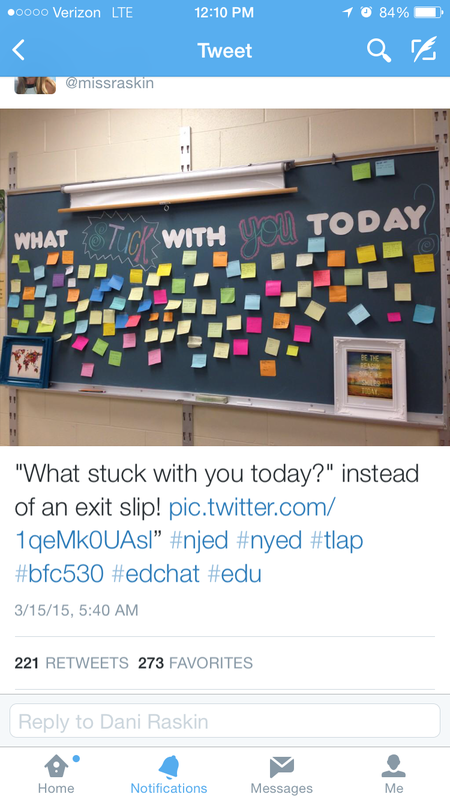 Since the first week of school "What Stuck" has become an established routine in which students take out a Post It (included on their supply list at the beginning of the year) and write down their big takeaway from the day's lesson. 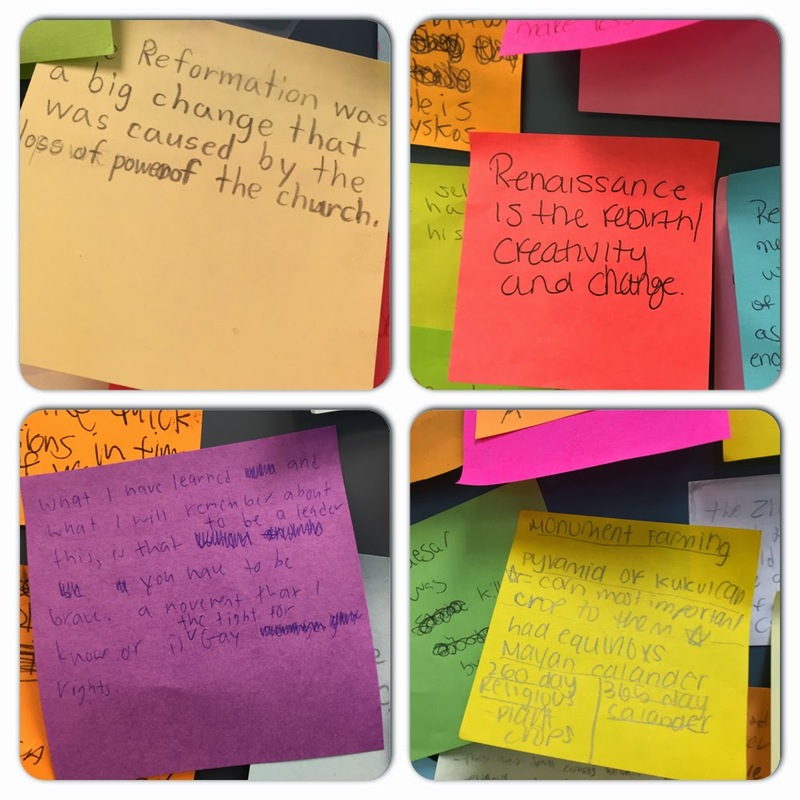 This offers students the time to purposefully reflect on what pieces of the lesson they understood and what they might need clarification on. After students have completed their "What Stuck," I have them share aloud with each other and me before sticking the Post It on the board. The nature of this transparent reflection and kinesthetic learning experience has proven to be engaging and motivating for even the most reluctant of my special education students. As the year comes to a close I plan on using the Post Its to conduct a review game that will be similar to Jeopardy in which students will pluck a Post It from the board, give the 'answer' and then their classmates will create a question to go with it. In the spirit of reflection I find myself using the "Start, Stop, Continue" feedback model when assessing my approach to next year. "What Stuck" definitely falls under the 'continue' category. I hope that for many of you it'll be a 'start'! I would love to help or offer any advice for anyone interested in creating an iteration of this, so feel free to reach out to me to share ideas or questions. This past Saturday I had the opportunity to be the moderator for my best friend, Adam Schoenbart, while he presented for #GoogleEduOnAir (a free online professional development conference for educators) about Using Google+ to develop stronger classroom community and enhance student learning. In the past, I have done a few Google Hangout sessions which I've always thought were awesome, but the experience of partaking in this worldwide conference was powerful and transformative. As of right now our session has gotten over 500 views, which is absolutely mind-blowing to me. The influence and connectivity I felt as a result of presenting to such a large audience reinforced the importance of instilling that same empowering, giddy, and excited feeling in my students. Moving forward, my goal is to continue offering them opportunities to create and share with authentic audiences that extend beyond the walls of our classroom. The next astonishing thing to me was the ever-present awe I feel at being in a profession with like-minded people that enthusiastically give up their free time in order to spend more time perfecting their craft. 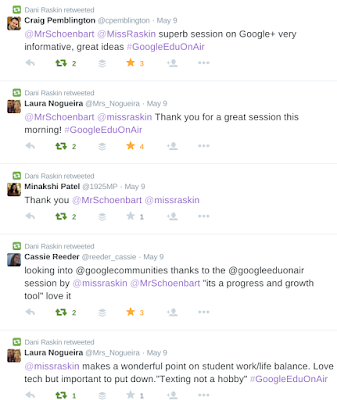 #GoogleEduOnAir brought that admiration to a whole new level. It truly made me realize how lucky I am to be in a profession with people that proudly wake up at 5:29AM to partake in daily Twitter chats (#BFC53), or give up weekends to attend EdCamps and similar professional development conferences. I believe it is a rarity for anyone to love their profession that deeply and be so devoted to their career. The opportunity to interact with so many equally passionate and curious educators gives me a deep sense joy and a wave of passion for my profession and continued use of #edtech. My biggest takeaway and the absolute best part of this experience for me was being able to continue conversations on Twitter after the session was over. I talked to people with similar policies and legal limitations in their district regarding Google Plus and it was nice to know that we are all in the same boat of desperately wanting progress while simultaneously feeling a little bit stuck. There will likely be a future blog post dedicated solely to this topic, as it has been a hot issue lately among many people in my PLN. 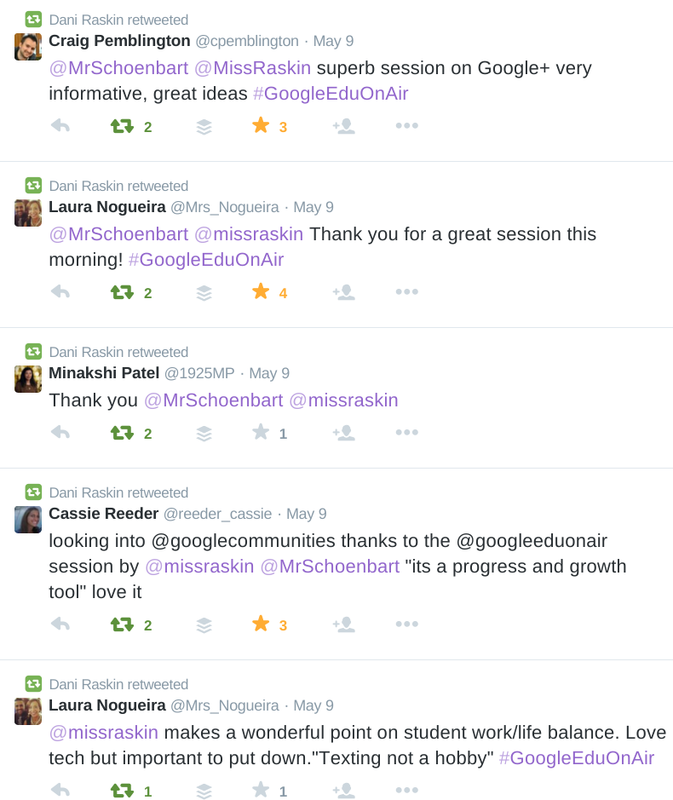 While I don't think that conferences like #GoogleEduOnAir replace the value of face to face interaction (especially after the Ednado conference I went to back in April and the opportunities for connectivity that it led to - hey #EdJusticeLeague! ), the convenience and ease of an online conference is an exceptional and productive alternative. I absolutely love the idea of FREE virtual professional development opportunities that connect global educators at whatever time and place is convenient for each of us. Plus, any learning that can take place from the comfort of my couch while I am in PJ pants and eating pancakes is always a major win! 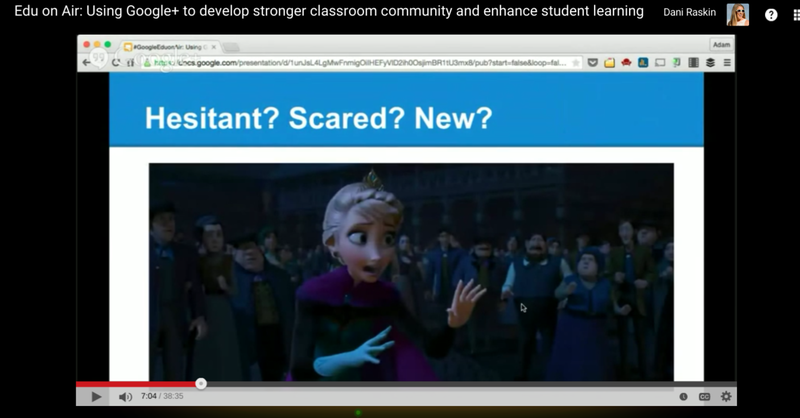 Welcome to the Pancake Professional Development blog! Thank you for taking the time to stop by and check out what I've got to say - Although, I'm not 100% certain what that will be just yet, but it is great to know that I have a platform and an audience with whom I can share my experiences and enthusiasm as it relates to teaching and #edtech. This is a test post, but I look forward to writing my first 'real' blog post later this week. Happy Sunday, everyone!